namaḥ (n/V) – adoration, homage; candra (m) – moon; arka – beam, ray, the sun, fire, praise, song, sound, roar, singer; candrârka – sun and moon saṃpūrṇa – full, replete, filled or richly furnished, whole, entire, abundant, finished, accomplished; nayana – leading, directing, managing, conducting, “the leading organ”, the eye; dyuti (f) – splendour, beauty, majesty; bhāsure – shining, radiant, bright, splendid, (ifc) excellent in, distinguished by; hara – [a holy sound], carrying, bringing; taking, receiving, seizing, robbing; ravishing, charming; removing, destroying; dvirukta – twice said, repeated, doubled; tuttāre – [a holy sound]; viṣama – uneven, unequal, odd, difficult, disagreeable, terrible, bad; jvara – fever, pain, grief, sorrow; nāśini (f/V) – perishing, perishable, [ifc] destroying, removing. You dispel all horrifying epidemics. The twentieth homage is to Lhamo Rithrodma,Tib the “Mendicant Tārā”, who averts all diseases. She is orange and her hand holds a vase of nectar on a blue lotus. Her left eye is like the full moon and her right eye is like the sun. Her right eye emits blazing rays that burn all the lords of diseases, (those who command the evil spirits that bring disease) like haystacks. 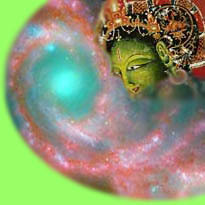 Clear nectar flows from the moon, (her left eye) curing the causes and effects of diseases and epidemics. Her mantra, OṂ TĀRE TUTTĀRE TURE NAMA TĀRE NAMO HARA HŪṂ HARA SVĀHĀ has two HARA sounds and a TUTTĀRE. The mantra can cure even the most dangerous incurable epidemics. The ultimate meaning is that if the mother-sphere of transcendent wisdom is realized, the most dangerous epidemics of afflictions, their causes and fruitions, can be cured.